Let's start things off by going through some IDP news, notes, and commentary from Week 4 of the NFL season. After a relatively "quiet" first three weeks of the season on the injury front, things began to unravel in Week 4 as we saw a myriad of top players suffer fairly significant injuries. Even before Week 4 games officially started, IDP owners get horrendous news as it was announced that J.J. Watt will miss the remainder of the season as he re-injured his back and will once again have to undergo surgery. Gerald McCoy had to leave Sunday's game with a calf injury and was unable to return. Teammate Noah Spence was also forced from the game with a shoulder injury and did not return. Both players are still being evaluated as of the release of this article but are questionable at best to play this week. Rookie Deforest Buckner injured his foot against the Cowboys on Sunday afternoon and is currently considered doubtful to play on Thursday night against the Cardinals. All-Pro linebacker Navorro Bowman was carted off the field after suffering a non-contact injury to his lower leg. It was announced after the game that Bowman had torn his Achilles and will miss the remainder of the season. Michael Wilhoite is probably the leading candidate to play every down in Bowman's place. Gerald Hodges and Nick Bellore will likely battle for playing time at the other inside linebacker spot with Shayne Skov possibly getting in the mix. The 49ers have been very inconsistent with their usage of inside linebackers not-named Navorro Bowman however, so I wouldn't be entirely shocked to see a rotation of three to four linebackers on the inside in the short-term. Denzel Perryman, who has been a decisive player in the IDP world, went down with a shoulder injury in the second quarter of last week's game. Although Head Coach Mike McCoy stated the injury is "not a major concern", Perryman's status for this week's game remains up in the air. Most of the headlines this week concerning Deion Jones will likely focus on his hit that caused Cam Newton to leave the game with a potential concussion. However Jones suffered an injury of his own (calf). The good news is it doesn't to be overly serious and the team is hopeful he will lace up for the team's Week 5 tilt against the Broncos. Sean Weatherspoon ruptured his Achilles and will be shut down for the rest of the season. It's unfortunate news for a veteran who was having a resurgent year. With Deion Jones, Paul Worrilow, and Devondre Campbell all nursing injuries, the Falcons are heading into October extremely thin at linebacker. Long-time Panther Thomas Davis had to leave last week's game with a hamstring injury. Head Coach Ron Rivera said he should be fine but admitted he hadn't talked to team trainers about the situation yet. Despite getting in limited practices for most of the week, Dannell Ellerbe was once again inactive on Sunday, leaving Craig Robertson in the starting lineup. With James Laurinaitis a surprise inactive as well, journeyman Nate Stupar got a spot start. Both players are likely to return next week which means Robertson (who has had 41 total tackles in four games) probably heads back to the bench and loses virtually all his fantasy value. Malcolm Smith exited Sunday's game in the third quarter with a groin injury. Ben Heeney filled in for Smith and the green dot was passed from Smith to rookie Cory James. There hasn't been much information released on Smith's injury but he was reportedly in discomfort in the locker room after the game. And given the nature of soft tissue injuries, it wouldn't surprise me if this is a multi-week injury. Ryan Kerrigan has a left elbow sprain and is considered "day to day" by the Washington medical staff. Safety/linebacker hybrid S'ua Cravens finds himself in the NFL concussion protocol along with teammate David Bruton after taking a blow to the head in Sunday's contest against the Browns. Both players Week 5 status' will be determined later in the week and will depend on how quickly they pass through the protocol. Both T.J. McDonald and Eric Weddle were evaluated for concussions during their respective games. They both passed them however and were able to return to the game. Tyvon Branch re-injured his groin and did not return to the game. We should get a better sense of his Week 5 status by mid-week but he doesn't have much recovery time as the Cardinals play on Thursday night. I'd look for alternative options. Kahlil Mack finally got on the board with a sack last week showing owners why it pays to be patient with your elite pass rushers. He had 3 QB hits in the game so could have very well had another sack or two. Plus, he's on pace for 76 total tackles. Breath easy. Vontaze Burfict played nearly 75% of the team's snaps in his first game action since last season. Although the 2-1 stat line was disappointing, the Bengals faced a below average number of rush attempts and the Bengals stat crew suppressed the tackle numbers issued throughout the game. With 10 days of rest and a run-heavy Cowboys offense on the schedule, things should be much better for Burfict in Week 5. Zach Brown continues to rack up tackles at a torrid pace and now leads the NFL with 52 total tackles. He also has a sack and 2 forced fumbles. Obviously, I don't think this pace is sustainable. But I do think the we've seen enough over four weeks to elevate Brown into the fringe of the elite tier of linebackers. He should see plenty of tackle opportunity and has the benefit of the second most generous home stat crew to keep his floor relatively high. Sean Davis dressed for Sunday night but was an emergency option only which explains his zero defensive snaps and complete lack of production. Week 5 will see several players return from suspension - Rob Ninkovich, DeMarcus Lawrence, Marcell Dareus, and Aaron Lynch. The first three are worth a pickup in most leagues if they are still available on your waiver wire. 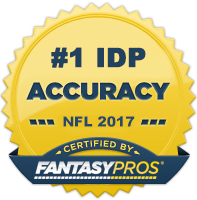 Now onto The Guru's IDP waiver wire selections for Week 5! DT Nick Fairley (NO) - After a solid start to his career, Fairley fell off the map in recent years due to injury issues. He seems to be getting himself back on track lately as he's put up 1.5 sacks in each of his last two games. He's seeing enough playing time to keep posting decent tackle numbers and has some sack upside for an interior lineman. For those in DT-required leagues, he's worth a look as a DT2+. DT Clinton McDonald (TB) - McDonald has established himself as a volume dependent, high floor DL3- option over the last few seasons. With the Buccaneers suffering multiple injuries along the defensive line, McDonald should have more opportunity to produce. He's not a high upside option by any means, but if you've been struggling for consistency at the position, McDonald is a nice fill-in. DE Derek Wolfe (DEN) - Wolfe had 2.5 sacks last week bringing his season total up to four. He's also increased his solo tackle count in each week and is tied for the league lead in the category. With so much attention focused on Von Miller and the rest of the outside linebackers, Wolfe should continue to have winnable one-on-one matchups. He's not likely available in deeper leagues, but for those in shallower formats, he's worth consideration as a high floor DL3+. LB Jatavis Brown (SD) - Brown, a rookie 6th round draft pick out of Akron, was thrust into the starting lineup after an season-ending injury to Manti Teo in Week 3. He wound up playing 93% of the snaps in Week 4 and led the team in tackles with 7 (all solo) after Denzel Perryman left the game in the first quarter with a shoulder injury. Brown becomes a must start in most leagues if Perryman remains out this week. And even if Perryman returns, there is enough room for Brown to be a moderately high variance LB3+. LB Vince Williams (PIT) - Williams was filling in for the oft-injured Ryan Shazier who was nursing a knee injury. He had a MONSTER game on Sunday Night Football registering 15 total tackles (13 solo) and a sack. It's not yet known if Shazier will miss another game, but if he does, Williams becomes a very attractive pick up in Week 5 against the Jets. He doesn't possess the same type of speed/coverage ability as Shazier, but is instinctual enough to consistently be around the ball and rack up starter-type tackle numbers as an every down linebacker. LB Cory James (OAK) - James was mentioned in this article last week, but he deserves another callout after a 15 total tackle breakout performance against the Ravens. Given the stat line, some may assume LB1/LB2+ potential from James moving forward, but I think the numbers are inflated. First, the Raiders defense saw 89 snaps, which is way above average. Second, Malcolm Smith left the game early with a shoulder injury which opened up more opportunity for James. As I mentioned last week, I still think James falls into the LB3 range and is worthy of a pickup in most leagues - I just wouldn't expect elite numbers. LB Michael Wilhoite (SF) - After receiving minimal snaps through the first three weeks of the season, Wilhoite started over Gerald Hodges and played every down in Week 4. Wilhoite became a tackle monster after Navarro Bowman went down with a torn Achilles. Although the 49ers have been wildly unpredictable in terms of Wilhoite's playing time, he's the current front runner to be the top fantasy option on that 49ers defense moving forward. Gerald Hodges and Nick Bellore will likely fight it out for the other inside linebacker spot. S Vonn Bell (NO) - Rookie Vonn Bell got the start at free safety last week after the Saints switched things up and benched veteran Jairus Byrd. Bell had a solid game with 6 solo tackles and a forced fumble and has been an above average player in terms of tackles per snap so far this season. If he continues to start, consider him a high floor DB3. CB Logan Ryan (NE) - A lot of owners will be scrambling to the wire to pickup Ryan after a monstrous 17 tackle performance (13 solo) against the Bills. Although I think he's shown enough throughout the season's first four weeks to deserve to start most weeks in CB-required leagues, I don't think he will be more than a high variance DB3 moving forward. The Bills controlled the time of possession and were exploiting the Pats defense with quick inside slot routes which gave Ryan a ton of opportunity that he's not likely to see again moving forward. He plays the Browns next week who haven't been a great matchup in terms of points allowed to cornerbacks, so I would temper expectations for him in Week 5. CB Kendell Fuller (WAS) - The injury to Bashaud Breeland has forced the 'Skins to play their 2016 third round selection probably earlier than they would like. As one would expect, the Browns went after the first year player early and often which lead to 7 tackles for the youngster. We've seen the "rookie corner rule" work many times before in fantasy and this could be another instance where owners can scoop up Fuller in deep leagues/CB-required leagues as their CB2 and get a few weeks worth of solid production.